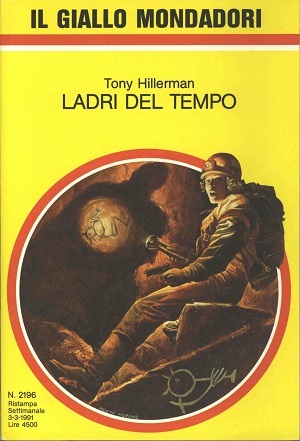 This is a reissue of the 1990 Italian edition of A Thief of Time. This edition was published in 1991 by Arnoldo Mondadori Editore in Milan, Italy. The series, Il Giallo Mondadori, was published weekly, and has a two column format. This edition, number 1747, was printed for readership for the week of March 3, 1991, and contains an interview with Tony Hillerman, originally published in the US mystery magazine The Ellery Queen. Tony Hillerman's original text was translated from English to Italian by A.M. Francavilla. The cover was designed by Prieto Muriana. The cover is a bright yellow with red bands framing an inset illustration depicting a startled woman in caving gear holding a gun pointing a flashlight at a rock wall that illuminates a Kokopelli pictograph and a shadow of a man. Format: Paperback, 19 x 12.9 cm. Binding: Bright yellow paper covers with 2196, the title, and author printed in black vertically on the spine. There are black-and-white advertisements printed on the inside covers. The inside of the back and front covers contains advertisements for other Il Giallo crime novels.